According to a bunch of people on Yelp, which, yeah I know may not be the most accurate source of information, Mecine Eatstation is closing its doors and wrapping itself in a cocoon of renovation. What emergers will be woefully different. Medicine is perhaps my favorite vegetarian restaurant. Did I say is? I meant was. 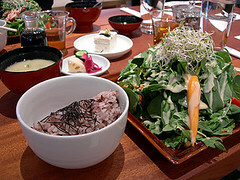 Medicine served a modern take on Shojin cuisine, which is sort of like super healthy vegetarian monastery food. It’s unique, to be sure. They had wonderfully odd tasting courses and sake pairings. They had a black sesame tofu that curled my toes. They had the richest and most savory miso in town. But that will be no more. When Medicine Eatstation shrugs off its cocoon it will no longer be a vegetarian restaurant based on 5,000 years of tradition. Instead, it will sell . . . fish and bento boxes. To the business lunch crowd. How utterly original, eh? Is it just me or does anyone else think “Medicine” was an incredibly lousy name for a restaurant? Tinman, thankfully the logo seen on the street was a stylistic M, only when you got close did you see the full word. I recall thinking it was odd, too, and then assuming it must be a sleek vodka bar, or other ‘tonic’. I tried it on a whim, because the austere design appealed to me, and I loved it. Their house roll was delish, and they had an eggplant dish that was suprising, but very very good. And you sat a really long (beautifully crafted) wood tables, alongside strangers, which, for some reason, I really love doing. Thank GOD! Where’s the beef.